I don’t care if Robin Hood is really a war movie. There is a lot of warfare and talk of war but the purists would probably deny it the access to the war movie realm. I can’t. I am biased. I am partial to Russell Crowe – my favourite actor – I am partial to Ridley Scott – watch all of his movies, they are worth it – I am partial to Cate Blanchett – one of my favourite actresses. 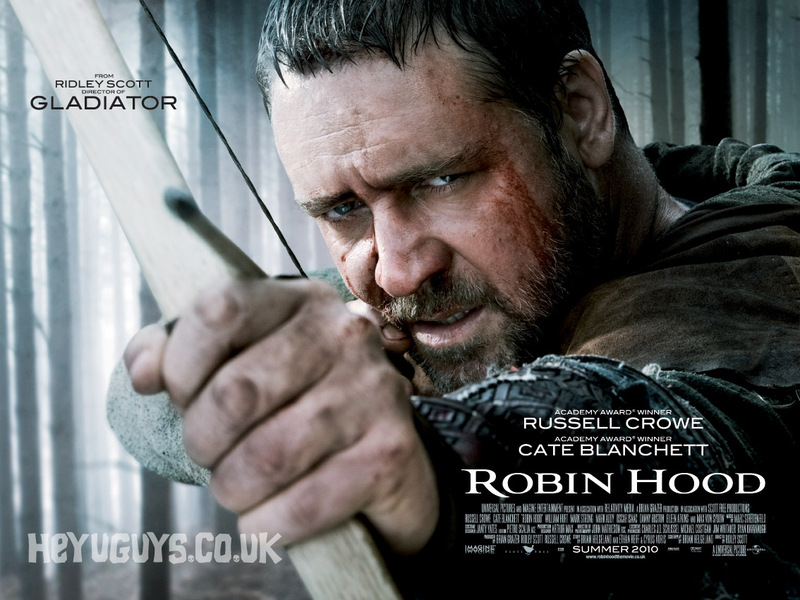 In short Robin Hood is well done, has a great cast and is very entertaining. It doesn’t make the world a better place or will revolutionize cinema history but it is well woth watching. I waited for this to come out on BluRay before I watched it and was looking forward to it like a child (Is it available yet? Is it available yet?). I was not disappointed. I truly enjoyed every minute of it. What we get to see is the pre-history of Robin Hood, the years before he becomes an outcast (will there be a sequel?). At the beginning he is in the middle of a big battle in which King Lionheart is fighting against the French. Robin Longstride is not a noble man and since he is too outspoken he endangers himself and those who follow him. He is sentenced and if King Richard hadn´t died, he would have been bad off. But Richard Lionheart is killed and Robin takes advantage of the chaos that follows the king’s death and escapes with his buddies to the sea. Sir Robert Loxley who is to bring the crown back to England and hand it over to the new king is murdered on his way home. At that very moment Robin and his men come along and the dying man asks him to return his sword to his father Sir Walter Loxley (Max von Sydow). Robin decides to pretend to be Sir Robert Loxley and first brings the crown to the new king and then travels on to the estate of the Loxley´s where he meets Marion, Roberts widow. Of course there is a love story but it is not corny. The country is in bad shape. People suffer. They are famished and impoverished and exploited by their king. The noblemen from the North want to overthrow the new king but there is a threat coming from the South. One of the king´s people is a traitor and conspires with France. It will take combined efforts to save Britain from invasion. I won’t tell you if this is achieved and how Robin Hood got his name, nor will I tell you why he became an outcast. You got to find out for yourself. Some historical facts about Robin Hood can be found on the BBC British history page. This entry was posted in Actors, Movie, Reviews, Trailer, War Movie and tagged Action Drama, Cate Blanchett, Crusades, Max von Sydow, Movie Trailer, Movies, Reviews, Richard Lionheart, Ridley Scott, Robin Hood, Russell Crowe, War Movies. I started to comment on the historical accuracy, but have decided that with our evolving relationship, I will cut you some slack on this one since you like it so much. It is an entertaining movie. Lol. I knew the sword of Damocles was hanging over my head. I really hope I did not give the impression that I thought there was any historical accuracy in this movie. This is not Arn The Knight Templar that I reviewed a couple of weeks ago that seems quite curate. I appreciate your consideration for my feelings though. I think – or hope- no one thinks this is accurate. I didn’t even bother to mention the time as it seems beyond the point. I added the BBC link for people to get a hint… We never get to see Russell Crowe in a “proper” war movie… My only chance before writing a review of Master & Commander. I fear that our modern audiences of doofuses (do you need an American slang dictionary to understand my comments?) now thinks there were Higgins boats in Medieval England because of this movie. I do know I was the only one in the theater who was laughing as those ramps dropped. That was part of the entertainment value of the movie for me. I like feeling superior to the audience. Get thee to M&C, Crowe is magnificent in it. An absolute miscarriage that Blimp is in the Top 100 and it is not! It is an amazing effort by Peter Weir. I show it in class with success. No worries about any slang… I get your point, you are not wrong and still… This movie wasn´t meant to be a history lesson. I have seen Master & Commander several times just didn´t review it yet. Guard! Turn! Parry! Dodge! Spin! Thrust! Couldn’t help but snicker as Robin Hood leads the King’s army to war (with his trusty buck-and-a-quarter quarterstaff. I mean bow..) against the French, either. Wait, wut? Probably the first time I’ve seen beehives used as a weapon, though. Which was nice. The sequels are gonna come… I am quite sure about it. I didn´t take it too seriously, just enjoyed it. Braveheartish? Not sure. Too long ago since I watched it and must say I found Mel Gibson insufferable in that role. That spoilt Braveheart for me. He is such a modern-looking man, no amount of long hair and war paint is going to cover that. Along the same lines -as for the era- those being King Richard is dead and now the evil John is King, and there are crusades going on at the time… I’m wondering if you have seen or reviewed the movie “Ironclad”. Though maybe, not strictly a “war” movie – there is a lot of it that deals with a real battle that really happened (though the history is a bit skewed in Hollywood’s favor). – BTW – I also came across a WWI film called “The Lost Battalion” wondering what your thoughts are. I haven’t seen it yet, but have it in the netflix queue. I am a huge King Arthur fan. I have promised a review long ago and will have to do so. I liked this Robin Hood although it takes some liberties with history. I’m a bit slow at cathching up on newer movies these days. I’ve seen a review of Ironclad and it is on my TBWatched list. And so is The Lost Battalion. I just watched and am about to review a new Russian movie The Fortress of War. It is a must-watch. You ae welcome, I’m glad you like the lists.